Author(s): Pollen K. Yeung, Pharmacokinetics and Metabolism Laboratory, College of Pharmacy and Department of Medicine, Faculties of Health Professions and Medicine, Dalhousie University, Halifax, NS, Canada. Shyam S. Kolathuru, Remigius U. Agu. Background: Previous studies have shown that catabolism of adenosine 5’-triphosphate (ATP) in red blood cell (RBC) may be a key factor for cardiovascular protection and maintaining cardiovascular homeostasis. Objective: To investigate the effect of cardiovascular injury on adenosine and ATP catabolism in systemic blood using a freely moving rat model in vivo. Method: After acclimatized to the experimental environment, Sprague Dawley (SD) rats were each given either isoproterenol (30 mg/kg) or saline (1 mL/kg) by subcutaneous (sc) injection. Blood samples were collected sequentially for up to 6 hours for measurement of red blood cell (RBC) concentrations of adenine nucleotides and plasma concentrations of adenosine and its oxypurine metabolites. Results: We have found isoproterenol induced 50% mortality under the experimental condition. 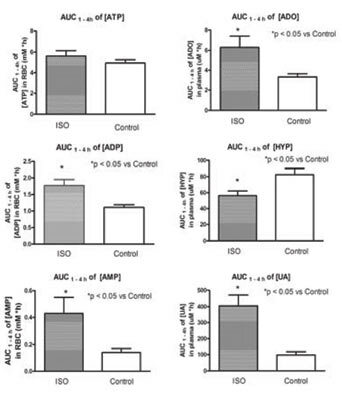 Plasma concentrations of adenosine (ADO) and uric acid (UA) and red blood cell (RBC) concentrations of adenosine 5’-diphosphate (ADP) and adenosine 5’-monophosphate (AMP) in RBC were significantly higher in the isoproterenol treated rats (p < 0.05 for all the comparison). On the other hand, plasma concentrations of hypoxanthine (HYP) were higher in the control group (p < 0.05), but there was no statistically significant changes in ATP concentrations in the RBC (p > 0.05). Conclusion: Cardiovascular injury induced by isoproterenol resulted in breakdown of ATP to ADP and AMP in the RBC and also breakdown of ADO to UA in plasma and other tissues. Keywords: Adenosine, ATP, cardiovascular injury, catabolism, energetic, metabolites, rats. Affiliation:Pharmacokinetics and Metabolism Laboratory, College of Pharmacy and Department of Medicine, Faculties of Health Professions and Medicine, Dalhousie University, Halifax, NS, Canada. Keywords:Adenosine, ATP, cardiovascular injury, catabolism, energetic, metabolites, rats. Abstract:Background: Previous studies have shown that catabolism of adenosine 5’-triphosphate (ATP) in red blood cell (RBC) may be a key factor for cardiovascular protection and maintaining cardiovascular homeostasis.